Using fit balls can make the most “simple” of exercises more challenging because we use our core muscles to stabilize the body while performing the exercise. Step 1- Lay back on a fitness ball with your feet flat on the ground. 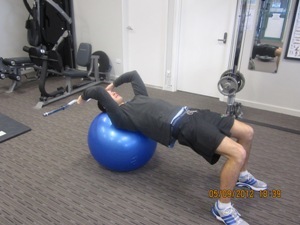 Hold the EZ bar above your head with fully extended arms. Step 2- Without moving the upper arms, bend at the elbows and move the bar behind your head. Make sure the elbows are facing forward throughout the movement and they don’t move out to the side. Step 3- Extend your arms until the bar is back to the starting position.